Welcome back to Jaime’s Lazy Late Night Cooking Corner, the show where I whip up last-minute single serve microwave treats every Thursday while wearing my robe. This week I cannot stop laughing as I murder a couple bunnies in search of the easiest, peep-iest way to make a microwave s’more. 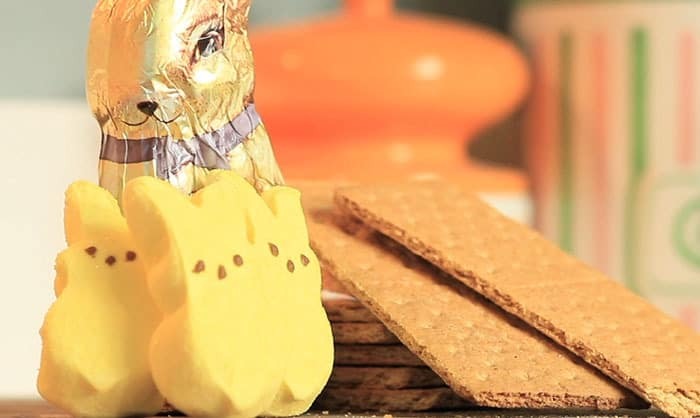 In only 28 seconds, you too can say bye bye bunny, hello s’more. In previous episodes we’ve made Single Serve Microwave Rice Krispy Treats, Microwave Blueberry Cobbler in a Cup, Microwave Strawberry Shortcake for Two, a Microwave Lemon Bar, Two-Minute Microwave Cheesecake in a Cup, 3-minute Microwave Guinness Chocolate Cake, and even a Microwave Cinnamon Roll. Now it’s time to decapitate a bunny. Still hungry? Try our famous recipes for One Minute Cup of Coffee Cake, Single Microwave Cookie in a Minute, 2-Minute Chocolate Nutella Cake or French Toast in A Cup. Start with one graham cracker. Smash a bunny head to bits and crumble on top. Microwave for 28 seconds as per cameraman Matt. Remove from microwave, place another graham cracker on top. 🙂 That’s so cute! Easter Bunny S’Mores! Makes me smile. 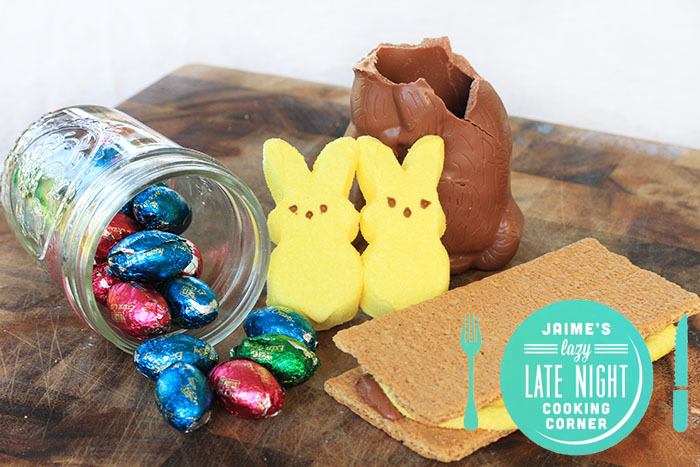 Will definitely make these with kids this Easter. Thank you for the recipe & the smiles.